"Flavorful green salad. Can be prepared in 10 minutes or less." Separate romaine leaves. Cut crosswise into 1/2-inch-wide pieces, wash well, and spin dry. With a vegetable peeler, shave 1/3 cup parmesan curls. In a blender puree garlic and anchovies with lemon juice. With motor running add oil in a stream until dressing is emulsified. Season with salt and pepper. 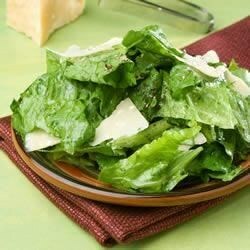 In a bowl toss romaine with dressing, 1/4 cup parmesan curls, and salt and pepper to taste. Divide salad between 2 plates and sprinkle with remaining parmesan curls. Okay. It's missing something, but I can't put my finger on it. Maybe I just prefer creamier caesar dressings. The dressing really is as good as the reviews say--and it's so simple! I added black and kalamata olives and pine nuts, and that put this salad over the edge. This is a new favorite! I LOVED this dressing!!! But I love any dressing with anchovy. I thought it was light and fresh and really different. Will make again and again since it's so easy too!! Good and simple, and definitely reminiscent of a Caesar salad. Open to lots of different variations if you want. Thank you for posting this!